All content on this site is protected by copyright, and may only be used in any form with the prior written permission of Dome Facility Services Group Limited Liability Company. The information and data provided here are for informational purposes only, Dome Facility Services Limited Liability Company does not assume any responsibility for their completeness and accuracy. Dome Facility Services Limited Liability Company shall not be liable for any damages arising from the use of websites, the inadequate operation or malfunction of thereof, and which result from delayed information transmission, computer virus, system failure, or other similar reasons. 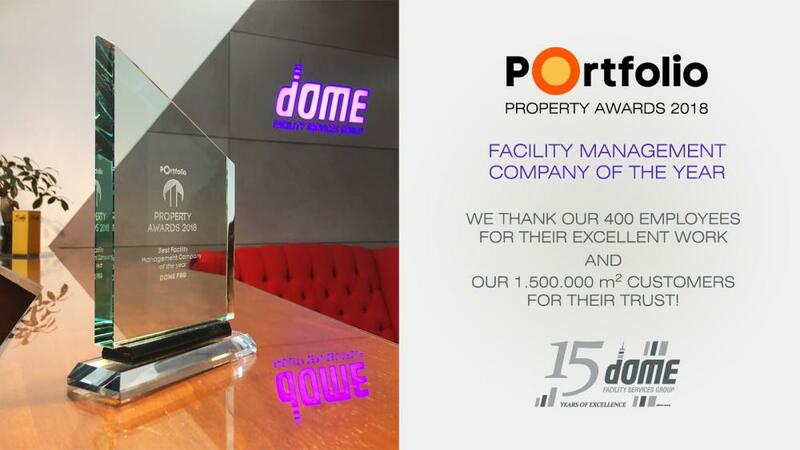 Dome Facility Services Group Limited Liability Company informs the visitors of the website that the company as the site operator is considered a data controller. The legal basis for this data controlling activity is the voluntary consent of the data subject under Article 5(1)(a) of Act CXII of 2011 on Informational Self-Determination and Freedom of Information. Dome Facility Services Group Limited Liability processes exclusively personal data provided by the visitors of the website. By providing your data, you, as a visitor to the website, shall agree that Dome Facility Services Group Limited Liability Company is entitled to register and manage the information you provided. You can provide us with personal information, e-mail address and telephone number via the Internet if you request information related to Dome Facility Services Group Limited Company or the members of the Group or want to contact us. By providing an IP address, you allow us to measure the attendance and traffic of our websites or to use them for diagnostic purposes. By providing your information, you agree that Dome Facility Services Group Limited Liability Company may register and manage this information until you expressly request the deletion of your information. Dome Facility Services Group Limited Company declares that your data are managed in full compliance with the relevant provisions of Act LXIII of 1992 on the Protection of Personal Data and the Publicity of Data of Public Interest. Dome Facility Services Group Limited Liability Company keeps confidential all data, facts and information regarding the person and information of its clients and the visitors of the website. You can send your comments on the website to the e-mail or postal address below.